All the cats we see today are grand-kittens of the two cats that were on Noah's ark. Today we have many “species” of cats. Biologists agree that all of the cat “species” we see today have come from an original cat “kind.” As cats spread across the world, they began to look very different through natural selection and mutations, but this is not evolution. 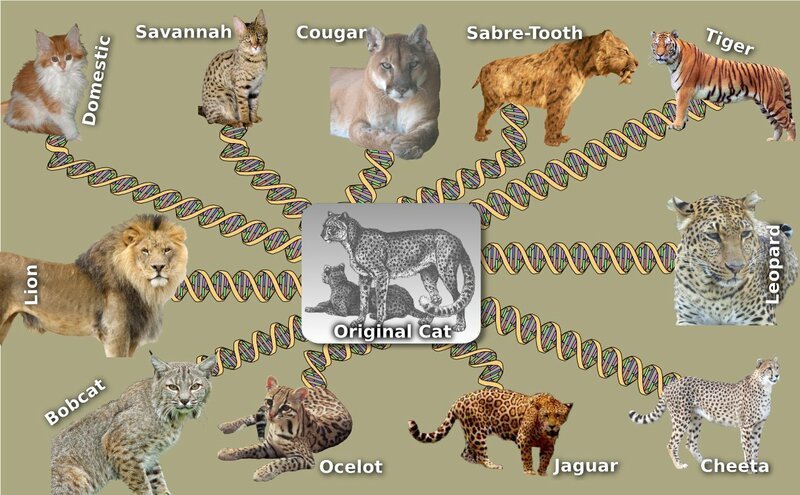 God created cats on day 6 of the creation week with all the DNA they needed to have long hair or short hair, stripes or spots, be big or small, and be able to roar or purr. All the cats we see today (including lions, tigers, leopards, and your house cat) are grand-kittens of the two cats that were on Noah's ark. 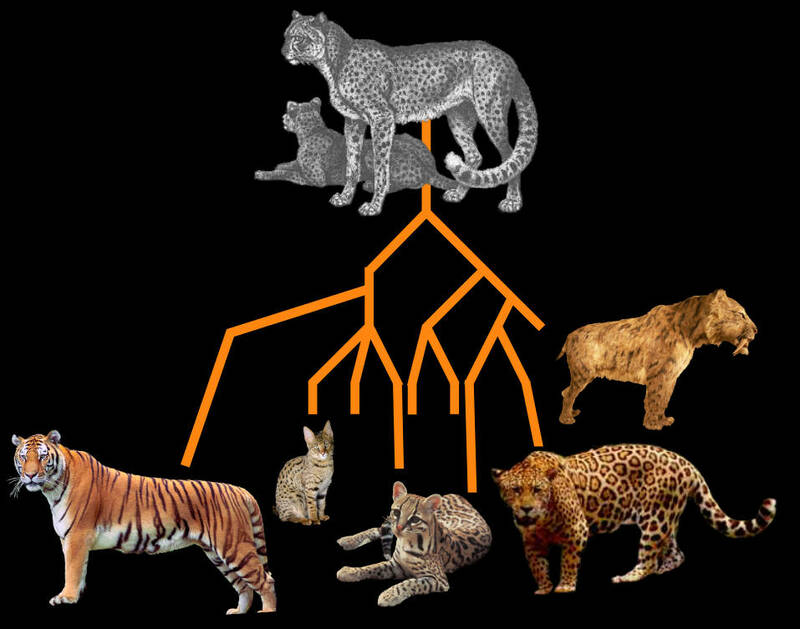 The evolutionary phylogenetic trees that appear in textbooks are full of imaginary links and are not based on science. Scientists have never observed one kind of animal evolve to another kind. 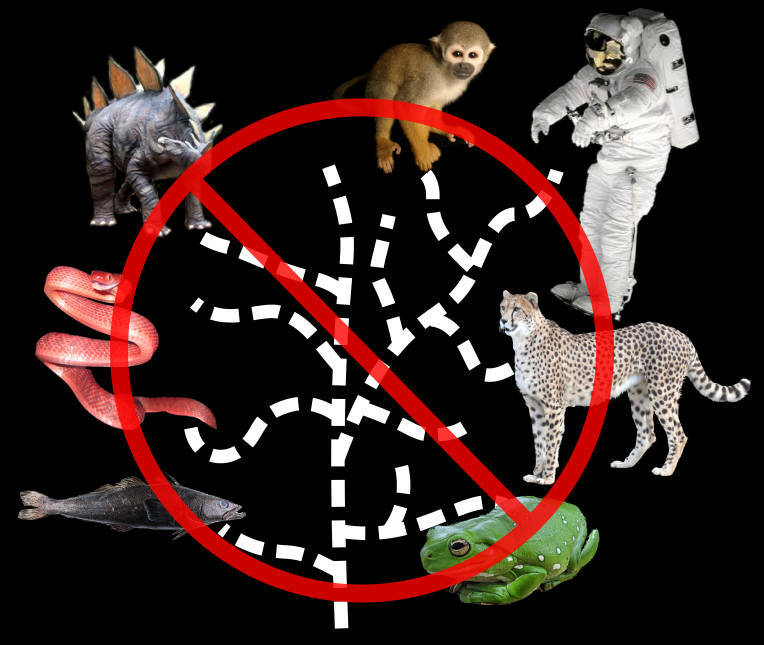 Lines in evolutionary trees are imaginary links, and not based on the scientific method. 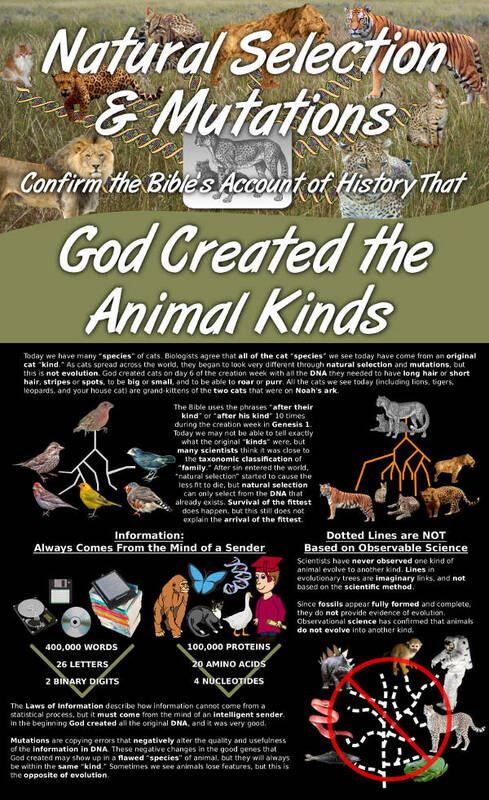 Since fossils appear fully formed and complete, they do not provide evidence of evolution. 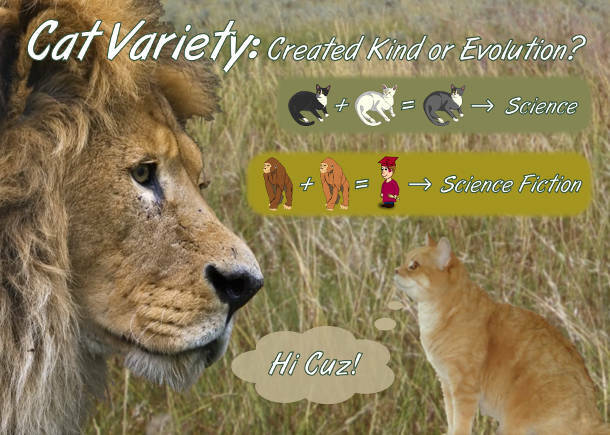 Observational science has confirmed that animals do not evolve into another kind. If information is rearranged then the quality and usefulness decreases. 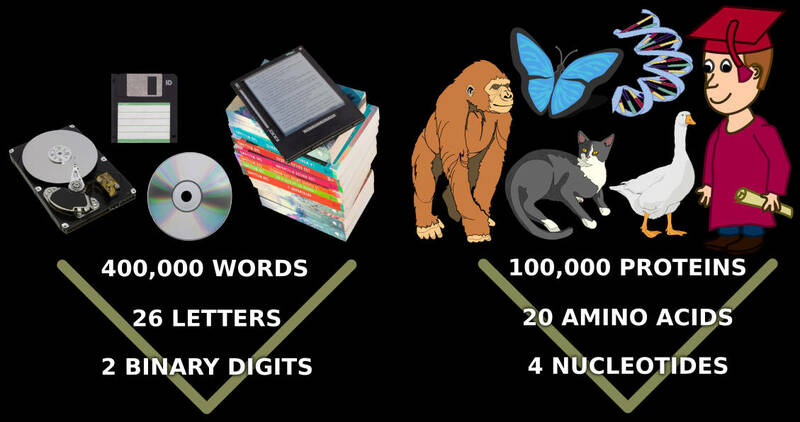 Books, DVDs, and computer programs all contain information. DNA contains more information than any operating system ever written. The Laws of Information describe how information cannot come from a statistical process, but it must come from the mind of an intelligent sender. In the beginning God created all the original DNA, and it was very good. Mutations are copying errors that negatively alter the information in the DNA. These negative changes in the good genes that God created may show up in a flawed “species” of animal, but they will always be within the same “kind.” Sometimes we see animals lose features, but this is the opposite of evolution. Every day the flu virus mutates, but it will always be a virus. Some bacteria are immune to antibiotics, but they are still the same kind of bacteria. Some roaches are resistant to pesticide, but they will always be a roach. It is against the laws of nature for a reptile to turn into a bird or an ape to turn into a man because God did not create them with that DNA. 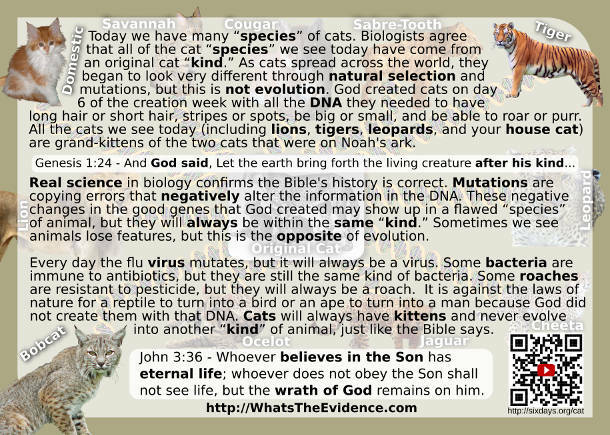 Cats will always have kittens and never evolve into another “kind” of animal, just like the Bible says. 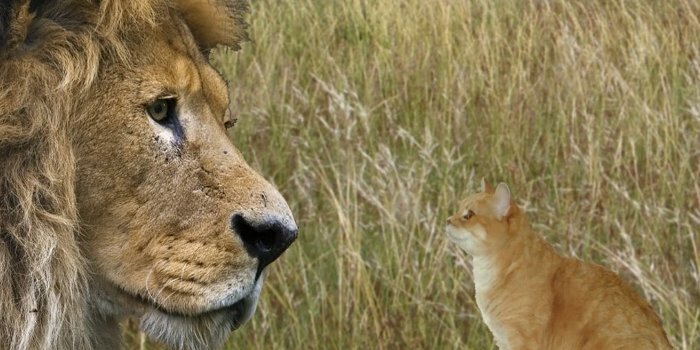 It is very likely that all the cats we see today (including lions, tigers, leopards, and your house cat) are grandchildren of the two cats that were on Noah's ark.